In early 2014 Sherri Lynn Wood, an artist whose work I greatly admire, put out a call for pattern testers for her book. Except we weren't really given patterns, we were given Sherri Lynn's loose instructions for improv quilt construction, which she called "scores." The score I was assigned was called Layered Curves. I won't go into the whole process of creating the blocks. You can check out Sherri's book for that! I will say it was my first time to sew any curve of any kind. And it was my first time attempting to work without a ruler. For those keeping track, I didn't use any rulers or templates when cutting my curves. I wasn't supposed to use a ruler at all, but I struggled to cut my blocks freehand so I did use a ruler to trim them up. From my instruction from Sherri Lynn, which was all done online, I didn't realize the significance of this choice. But later I would understand the importance of going ruler-free in this process, and wish that I had stuck with it. 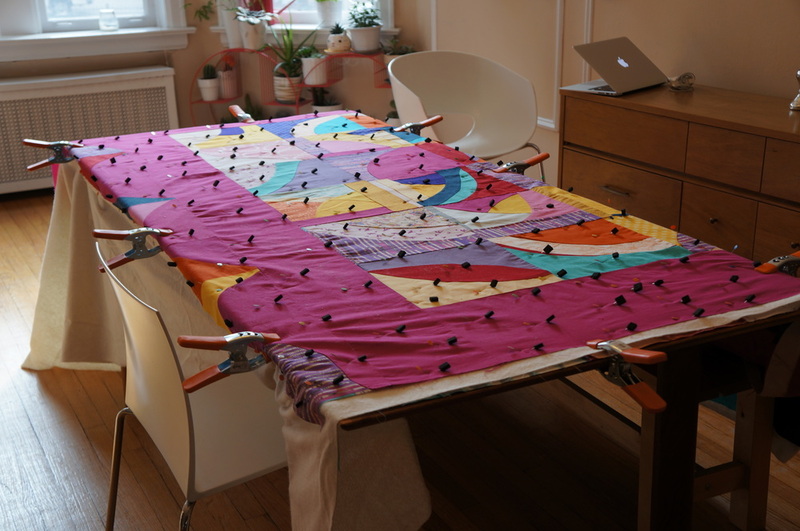 This quilt was finished in March, but I had to wait to share it until we got closer to the book's publication date. Sherri Lynn's book The Improv Handbook for Modern Quilters is coming out in the spring 2015. I can't wait to get my hands on it, even though my quilt was not chosen for publication in the book. I had a tumultuous relationship with this one. While in progress, I mostly hated it. When it was done, I loved it. After I took a workshop with Sherri Lynn Wood last month, I realized it is missing the expression of line that could have happened if I had put away my ruler as instructed. Like I said, I put it away for the curves, but couldn't make myself make blocks without it! I regret that now. But I still like this quilt. My favorite thing might be all the hand-quilting I did. 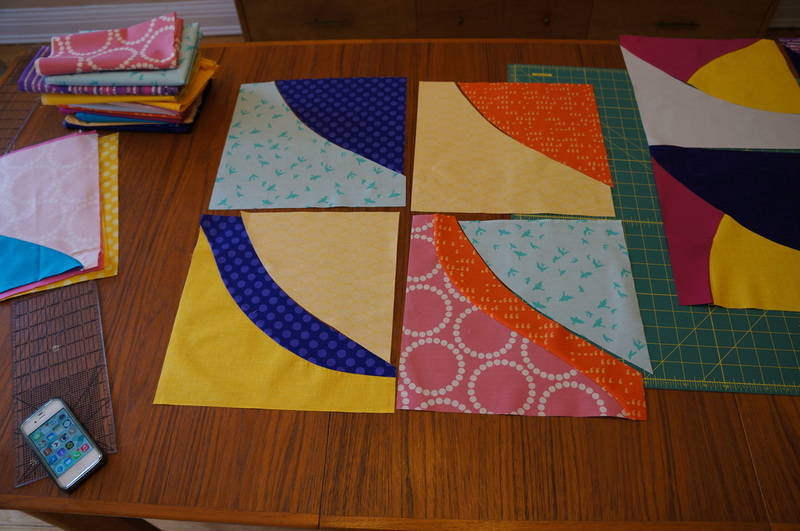 This was absolutely a learning process that made me push myself into uncharted territory as a quilter. I'm looking forward to working with Sherri Lynn again at QuiltCon, and trying more scores from the book when it drops! I'm also happy to say that this quilt will be hanging in the QuiltCon show.